Something comforting I can rely on every year is the release of a new Christmas novella from Melody Carlson. Her stories are usually full of plenty of Christmas cheer and something nice that happens that makes you feel all festive inside. Christmas at Harrington's is no exception. 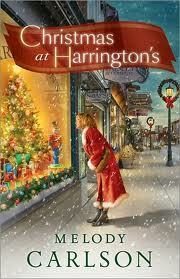 Christmas at Harrington's is about Lena Markham who has just been released from prison for a crime she didn't commit. She's eager to put that behind her though and try to live a new life. When she reaches out the people in her life around her, she begins to find unexpected joy and purpose in life. But unfortunately, not everyone knows about her past. Will Lena be able to start a new life or will the past and judgement catch up to her? I enjoyed this book but it didn't quite live up to its promise for me. I feel like it started out well and I really enjoyed as Lena started to put her life back together but the end felt a bit rushed and like too many Christmas story cliches were shoved in. Even so, I enjoyed my time spent with the book. There were a few plot holes for me as well. For example, Lena moves to this brand new town because there is supposed to be a job lined up for her, but then the owner of the store acts like she has no idea who she is. Also Carlson often spends a lot of time writing out the details of the day...Lena shopped and bought x and x and x and this is how much it cost. But I've read enough of her books to expect this.